The official site of the Rolex Sydney Hobart Yacht Race is again supporting Google Earth to track the race. The race began on December 26th and the positions are updated every ten minutes. 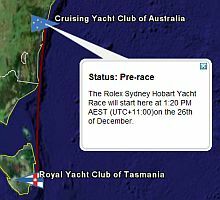 The route goes from Sydney, Australia to the Royal Yacht Club of Tasmania. This yacht race has been going on for about 60 years and has often been in the news. You can download the Sydney Hobart Yacht Race Google Earth network link and follow the race right now. The services that google offer to their customers, the detail & imagination to just get things started. Ideas such as combining with NASA to take us into outer space. Google!!!!!! you are an awesome company.